George watched in amazement as the girl’s body elongated and grew larger. Much larger. She sprouted wings, grew horns, and suddenly had a very large tail. She looked down at George, whose features had changed more subtly than the girl’s. He seemed older, more muscular, and his wooden sword was a real sword, longer and shiny. He pulled a helmet on and looked up at the girl as she flapped her wings and took off. She swooped around in broad, lazy loops overhead, stretching her wings and getting the feel of the wind under her. She tilted and took off to the north, flapping her wings in slow, powerful strokes. George took off in a loping run under her, crossing rolling green fields with sword in hand. They traveled that way for over an hour, moving from the fields into a more mountainous region. As the climbing became more difficult, George began panting with exertion. 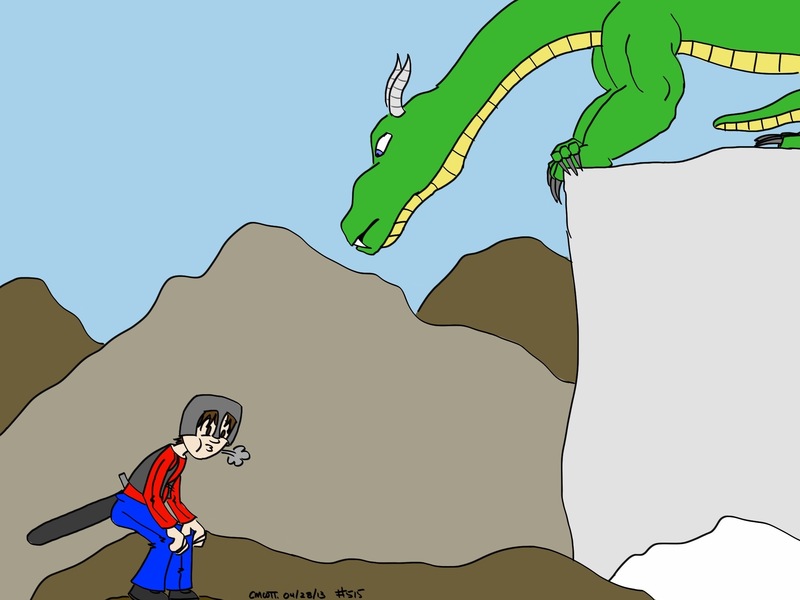 The dragon swooped down and alighted on a rocky promontory, flapping her wings to maintain balance. “Getting tired?” she asked, her voice a rumble. “Want a ride?” she asked, grinning a wide, toothy grin.